Other than Brighton Rock, whilst at school, (in Brighton, coincidentally) I had never read any of Greene's work until I came across a handful of his novels for sale in Penguin format a few weeks ago. 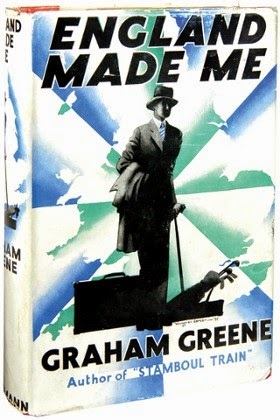 First published in 1935, England Made Me, also published as "The Shipwrecked", was one of Greene's earlier works. It revolves around the relationship between Anthony Farrant and his twin sister Kate. Anthony is a wastrel. A lost soul of middle-england drifting from job to job on the back of begged favours, none of which have been found to be suitable to him, or, from the perspective of the employers, for which he has had anything more than a superficial talent. Anthony is charming. He is an actor and the world is his stage. Inherently selfish, he sees the world and those in it as his scenery. Girls are his playthings, except, of course his sister, who, by that accident of nature, makes her a strange type of female, one that he is intensely fond of, but who is ultimately, not 'available'. For her part, Kate is is an adoring life partner who cannot bare the idea of a life without her twin. Her love for Anthony leads her to draw him into her work circle, where he is offered a job by her boss, and lover, Krogh, a Swedish financier of global standing. Anthony's innate sense of decency and fair play (beyond his own behaviour which is of course judged by an entirely different internal yardstick) leads him to fall out with his new boss. When combined with his new found friendship for a seedy, down at heel journalist, Minty, things begin to unravel. I love the characters in this work, mainly because there is plenty to dislike about every one of them! Each has his or her personality flaws laid bare, yet one is still able to sympathise with each of them at moments when they deserve it. Anthony has nobility, in spite of his lack of consideration for others. Krogh has a lost youth that one wishes he could recapture, in spite of his being cold and aloof. I thoroughly enjoyed it and am looking forward to getting to know some more of Greene's work.